We have long been speculating on whether Ireland will become a wine-producing country once global warming kicks in. But what will happen to whiskey production? Is there a danger that we won't be able to grow the necessary cereals in decades to come? Other crops, though, will thrive as Ireland becomes hotter and wetter. Barley and wheat will thrive west of the Shannon in the moist conditions. Maize will prosper throughout the country. So that's alright then. 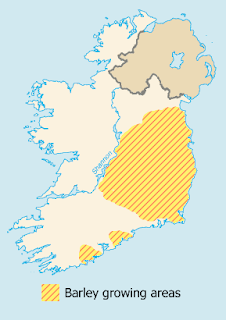 For comparison, the map shows the prime malting barley growing regions of Ireland as they are now. I adapted this from Greencore's website. As you can see, barley now grows east and south of the Shannon river so the changes forecast are very significant. As I noted in the previous post anyway, Irish whiskey can be legally made without Irish cereals, if that ever becomes necessary.